Recently I have been looking at a lot of online project management tools, such as Wunderkit, that I have already blogged about. Earlier this week one of my coworkers showed me Trello. This is very similar to Wunderkit in that in allows you to do collaboration with others, create multiple task lists, etc. But let’s talk about how it is different and some of the reasons I like it more than Wunderkit. Trello allows you to create Boards for different areas, much like Wunderkit allows you to create workspaces. 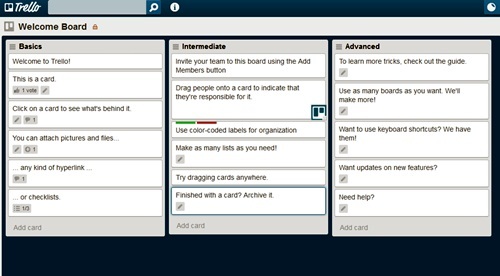 Within these boards you can create a variety of task lists, and then within those tasks, or as Trello calls them, cards. The biggest thing I liked about Trello vs Wunderkit was how it laid out its task lists. Basically it lists them vertically instead of creating horizontal lists. This may seem confusing at first and kind of different, but once you get used to it, it is a huge win. One of the things I didn’t like about Wunderkit was how the tasks were buried in the task lists. With them being vertical in Trello, you can see everything at a glance. No more digging through lists to see what is going on, what your due dates are, you can see everything for that Board with one look. I liked this feature a lot more as I feel I am better tracking and seeing what I have going on. Now within each card that you have in Trello under your task lists, you can add comments, updates, create check lists for that task, and much, much more. This gives Trello the ability to track more information and get more granular than Wunderkit. While Wunderkit does have notes, it does not link the information to the specific task that Trello does. Another nice thing I liked about Trello was the simplicity of its interface. While Wunderkit and other tools look much fancier, Trello is more simplistic and I find it easier to navigate, and even load within my browser. As I always say, with technology the moment you stop making it simple, is the moment you fail. While Wunderkit is really nice, and I may go back to using it, I find that it is a little big for its britches. The interface is slow, and performance can be flaky. A lot of this I think is the fact that they just came out of beta, and may not be prepared for the amount of use they are getting. The collaboration in Trello is pretty well organized too. You can share entire boards with other users, or just cards and task lists. There is even functionality to export some of your cards and information as well. I found the ability to share these features a lot easier and more obvious than in Wunderkit. A lot of that I think has to do with the simplicity of the interface. But let’s talk about one of the most important things to me that makes cloud based apps useful, is there an app for that? Yes, there is an iPhone app for Trello that allows you access to all your boards, lists, cards, etc right from your iPhone. There is not a specific one for the iPad yet, but you can easily install the iPhone version and use it that way. Sad to say though, there is no Droid app for Trello yet either. So if you are looking for a cloud based project management tool, that allows collaboration you can still use Wunderkit. It does look shinier, but if you want something that is a bit more simplistic, yet has more functionality I would highly recommend Trello. The more I use it, the more I have trouble going back to Wunderkit or other online project management programs.